This collection of seven soothing tracks will awaken, purify and enliven the energy centers of your body, whilst relaxing you from head to toe. This beautiful music is wonderful for chakra meditations, but of course you can listen to it any time you feel the need to relax, open your heart and clear your mind. Download instantly and enjoy on your favourite mp3 player or burn your own CD. Tribal percussion, ethnic instruments and deep, warm tones are blended together in this soulful composition that is both grounding and soothing at the same time. This gentle music will activate your base chakra, while preparing the physical body for deep relaxation. As we move up from your base chakra, the music of the sacral chakra becomes more emotional and more fluid. This music awakens and purifies your sacral chakra while engendering feelings of openness, warmth and connectedness towards others. The music of the solar plexus chakra has a brightness to it that invokes images of sunshine and inner radiance. You will notice that the music is very calm, but it is also very "alive" and energizing. 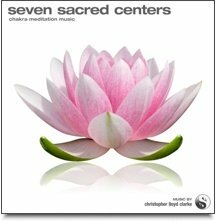 This empowering composition is wonderful for awakening and cleansing your solar plexus chakra. I like to think that this heart chakra meditation music speaks for itself. This is music of love and compassion, pure and simple. Enjoy the preview, and feel it! This mystical soundscape does not adhere to any of the "rules" that might govern traditional music composition. Intentionally unstructured – this dreamy, meditative chakra opening music will free you to explore your imagination, your intuition and the deeper aspects of your mind. Heavenly and sweet, the music of the crown chakra opens one up to the timeless, limitless nature of pure awareness. As the music unfolds, melodic bells gradually give way to a wash of celestial choirs and shimmering chimes that will uplift and inspire you to an elevated state of consciousness. "I just did your chakra meditation - Fabulous - felt it, loved it, have downloaded it - thanks heaps, am in the midst of a cancer challenge at the moment so that made me feel brilliant - will continue to use it." "Wow…that took me by surprise...It touched me sooo deeply...I wept throughout off and on…I felt something breaking up in my heart and being swept away…and then just peace...a kind of peace rarely felt...It was all so spontaneous and out of my control…Wow…"
"It's enchanting and relaxing, I wonder if this music is from heaven. I really don't have an explanation on what I felt the first time I heard the music. It was a great feeling I never had felt before ! I have panic and anxiety disorder , since listening to your music, have not felt to take my medicines . God Bless ! from Puerto Rico." "This is one of the most beautiful pieces of music I have listened to. The words, the pictures, but most of all the music leaves me feeling so peaceful and grateful for all that we have. Christopher, you are amazing." "Wow, it has stirred up a lot of hidden emotions for me and it took few days of being overwhelmed..but now i can feel my energy flowing in much better harmony :)"
"I really loved this recording, it gave me such peace! It also brought me to a very deep introspection, which I had never experienced before. I will keep listening to these to get the most out of all the recordings." "I highly recommend this album as it will fill you with love and compassion. It has become a part of my early morning ritual to listen to all the tracks while meditating. I look forward to each day with much more enthusiasm, life just gets better and better. A wonderful collection and a credit to Christopher Lloyd Clarke. Thank you"